It's that time again... time to visit the County and enjoy The Prince Edward County Studio Tour beginning this Friday. Visit downtown Bloomfield and artist & photographer, Tess Moffat of Windswept Studio. See below for more details. Click here to view my current newsletter. Ho, Ho, Hold the Frenzy... There is still plenty of time to purchase that perfect piece of art or give a gift certificate to that special someone on your Christmas list. Plan to have some New Year FUN! Let Tess treat you to some "Cherished Painting Time" in 2011 at Tess Moffat's New Studio. It's a wonderful time of year to tour the beautiful country roads of Prince Edward County. And now all roads lead to Bloomfield. 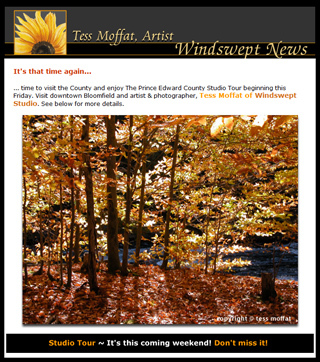 Windswept Studio has recently opened in a new location.You will find Tess at 346 Main St. Bloomfield, ON. Imagine yourself beginning this new year by celebrating your love of the arts. What better way to enjoy 2010 than to immerse yourself in a new art course or workshop? My newly designed website is online with NEW paintings, photography as well as my Fall & Winter Art Classes & Workshops. Be the first to learn about my upcoming classes, workshops, and the location where I may be showcasing my art and photography. Sign up for "Windswept News"